The 9S cosplay jacket features a Peter Pan collar, hidden buttons, and an embroidered design at the bottom. The double layer chiffon blindfold is thin enough so that you can see through easily, but dark enough to cover your eyes. The PU leather bag is functional so you are able use it to carry items. 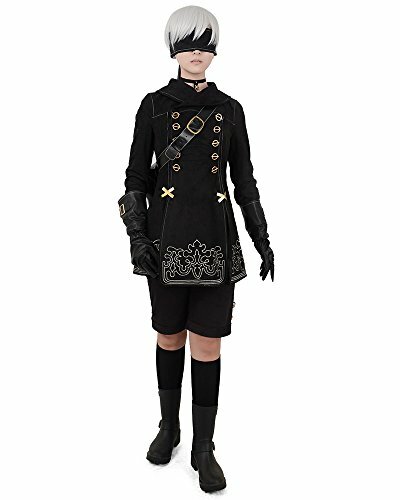 This 9S cosplay also comes with the PU leather gloves, decorative chocker and cotton socks to complete the look. Turn yourself into 9S by dressing up with this awesome outfit. It doesn't come with the wig or boots. GREAT QUALITY: The 9S cosplay jacket and shorts made of soft and durable suede, are extremely comfy and good for long-term use. NICE DETAILS: This 9S outfit, well made with delicate embroidery at the bottom of the overcoat, has you looking like the 9S in the game Nier. OCCASIONS: Cosplay, Theme parties, Halloween, comic con, etc. NOTE: The 9s cosplay wig is sold separately. Boots not included. The 2B costume is also available at this store. If you have any questions about this product by Miccostumes, contact us by completing and submitting the form below. If you are looking for a specif part number, please include it with your message.